Motorcycles have a tough time through the winter months. Grit on the roads and low temperatures are the perfect recipe for corrosion, but with just a little preparation and care, it’s possible to protect your machine from the worst that winter has to offer. Regular waxing will help to keep your paintwork in its best condition. Wax protects and preserves the lacquer and stops water spreading into crevices, gaps and holes. Polish contains abrasive ingredients while wax doesn’t – so, if you spot a little scratch, use polish to buff it out. The recommended sequence is: wash, polish and then finally wax, to seal it all in. It is essential that you remove all kinds of dirt from your chain – otherwise, dirt can infiltrate the links and increase friction, causing a grinding effect, It’s also important to lube your chain regularly, helping to increase its lifetime, stop friction and prevent corrosion. Ensure you clean the chain before lubrication, otherwise you’re simply sealing in dirt. 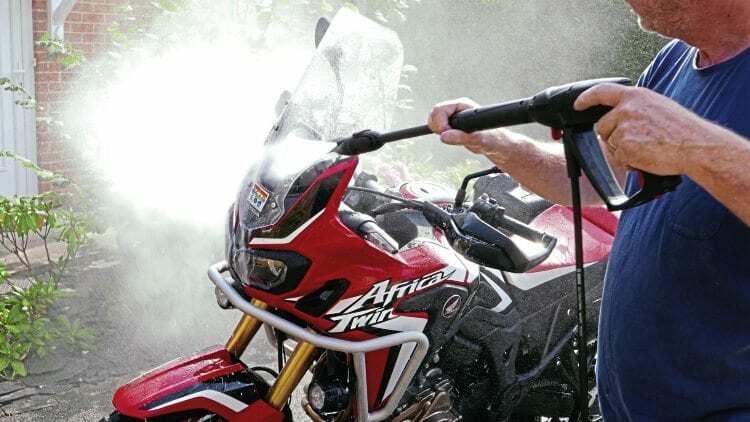 Dirt, grit and gunk from the road holds moisture, the primary source of corrosion on a motorcycle, so all metal on your bike should be cleaned regularly – and thoroughly dried. Also, keep a close eye out for dead insects – despite not causing corrosion, they can scar surfaces as they contain a mixture of enzymes and amino acids which are capable of reacting aggressively and attacking metal and lacquered parts. 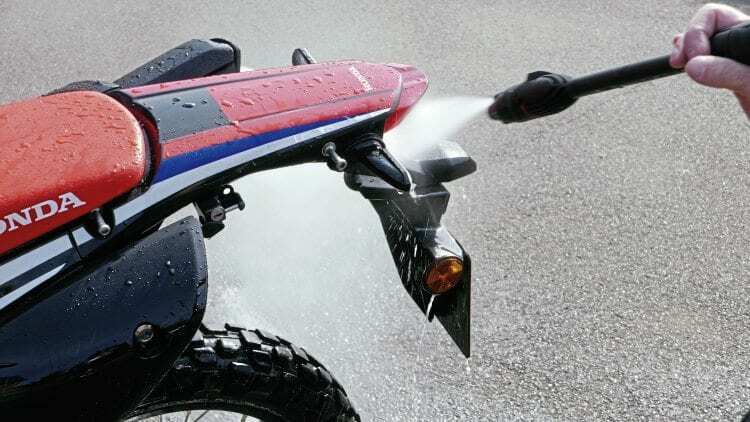 Some cleaning products can also dull paintwork, corrode metal and cause stress cracking – ensure your cleaning agent of choice is mild enough to not damage your bike, but strong enough to remove dirt. Under braking, small metal particles will be grazed off the surface of your brake pads. The particles can stick to other metal parts on your bike and potentially cause rusting. And don’t worry too much about rust on brake discs either – it’s caused by the iron disc oxidising. The next time you brake, the rust will be ground off, leaving blank iron once again. If you’ve been caught out in a downpour and you’re soaked through, don’t put your wet motorbike in a sealed garage before it’s cooled down. 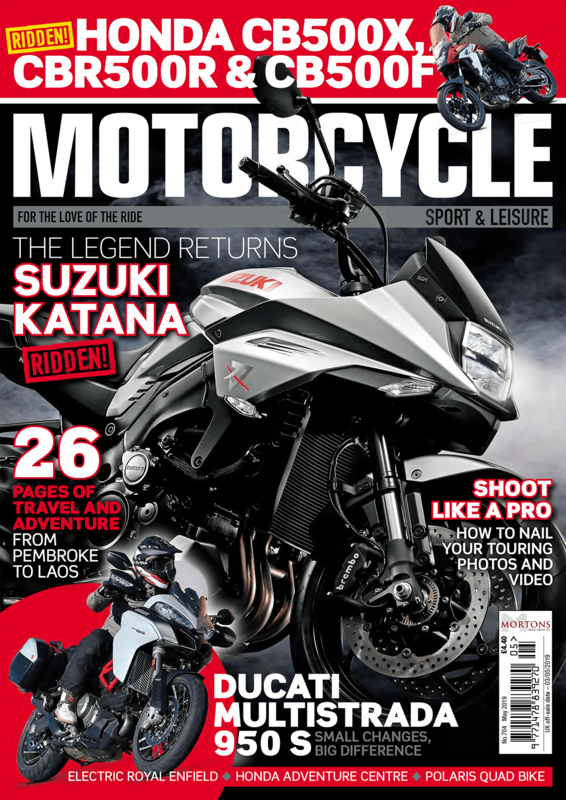 There’s a lot of moisture floating about when your bike is wet and the engine is still warm – in fact, it’s the perfect recipe for corrosion. 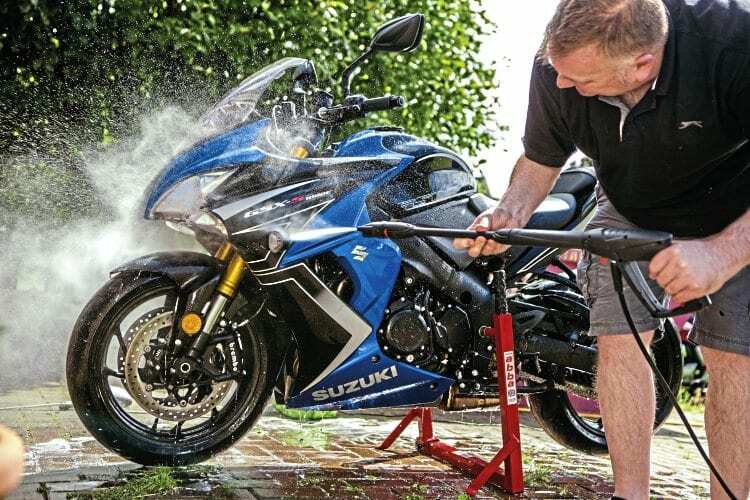 Basically, make sure you’ve dried your bike thoroughly before tucking it away. 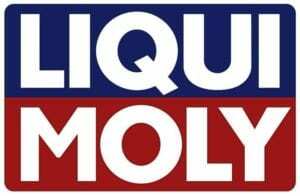 The Liqui Moly Bike Wash Cleaner is a renowned cleaning fluid specifically designed and developed for motorcycles and bicycles. It’s more than up to the job too. Just spray it on, wait 10 minutes, and wash it off. Easy. 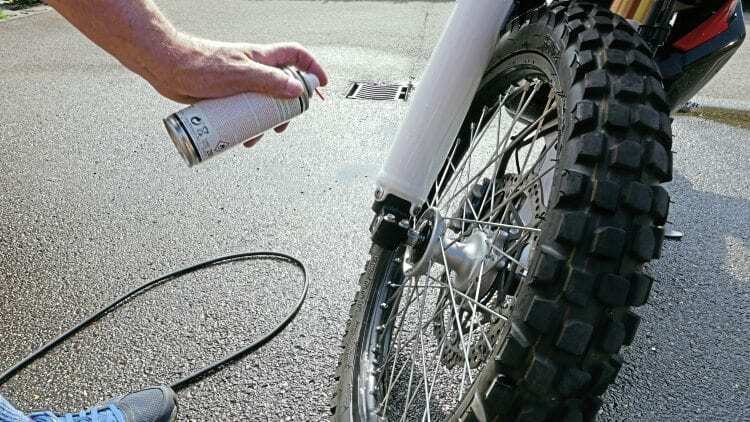 This spray lubricates, loosens rust, protects and maintains your motorcycle. It’ll keep moveable parts free and loosen stubborn rusted screws too. It’s great for protecting your bike and electrics against corrosion, will prevent squeaking noises and maintains rubber parts too. This is a specially developed cleaner with selected solvent combinations to allow fast, easy, cleaning and degreasing of structural parts on your motorbike. This is a really easy to use gloss wax spray. 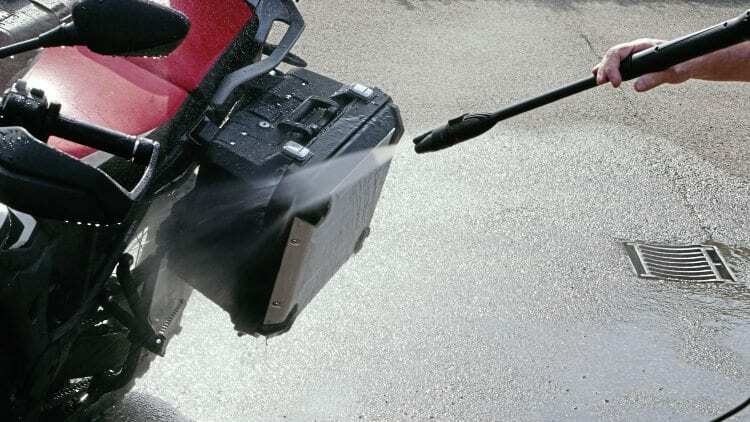 Small amounts of dirt are easily and quickly removed without causing scratching, producing a smooth, glossy finish. The resulting protective layer will help to hide slight scratches, and preserve your paintwork against the worst of the weather. This extremely adhesive and water resistant fully synthetic chain grease, which works to reduce chain elongation and helps to extend the service life of your chain. 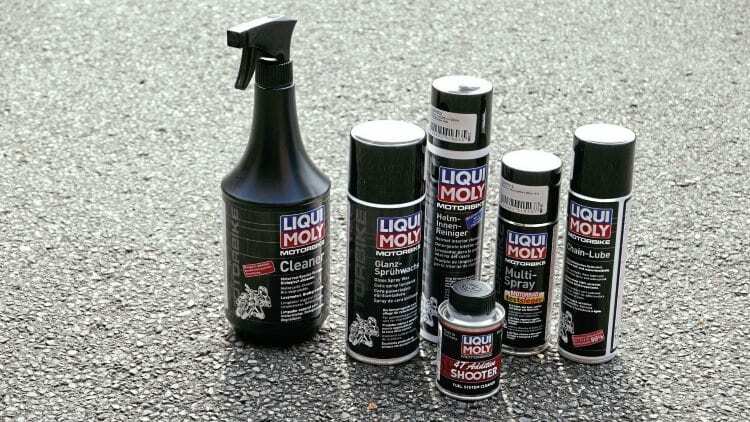 It’s recommended that you use it after cleaning your chain with Liqui Moly Chain and Brake cleaner.